The EIS series provides a solution for those industrial applications requiring a larger network diameter and greater throughput. Models exist that support both twisted pair and fiber optics. 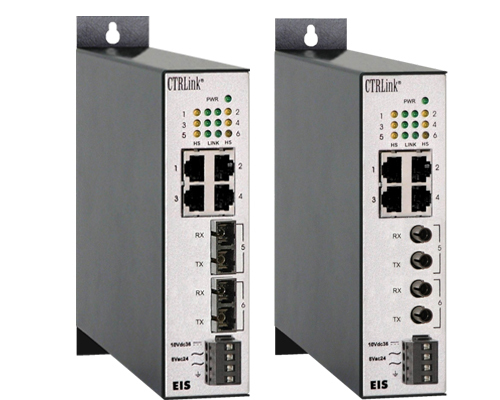 All models of the EIS series segment the Ethernet network into separate collision domains. The switch functions as a "bridge" between various data links creating a larger network diameter than can be achieved with repeating hubs. Each copper port automatically negotiates with its attached device the data rate (10 or 100 Mbps) and duplex (full- or half-) for that port. The flow control mechanism is also negotiated. For Full-duplex segments, the PAUSE scheme is used. For half-duplex segments, the backpressure approach is automatically invoked. The switch learns the port locations of Ethernet devices by reading Ethernet frames and observing source addresses. The switch then creates and maintains a table of source addresses and corresponding port assignments. From that time on, traffic is restricted to only those ports involved in a transmission. This allows for improved throughput since simultaneous transmissions can now be initiated on those ports. Table values are aged to automatically accommodate changes to the field wiring. If a broadcast, multicast or unicast transmission to an unknown destination is received on a port, all other ports are flooded with the transmission. The EIS6 models accommodate applications requiring a fiber backbone. These combine the benefits of switching technology and fiber optics, making them ideal for applications where longer networking distance-up to 15 km (single-mode)-and immunity to EMI/RFI is important. These benefits result in decreased downtime, fewer outages and improved reliability. The EIS6 models have 6-ports, with a mix of four 10/100 Mbps twisted-pair copper ports and two 100 Mbps multimode or single-mode fiber ports. All units are equipped with key features including wide-range, low-voltage AC or DC power requirements of the network wiring. They can be DIN-rail or panel mounted. To aid troubleshooting, the EIS series incorporates LED indicators for data rate, activity, link integrity and power. To view the UL listing for the EIS series, click either US or Canada. Click here to learn more about the EIS and UL 864.